After months of fretting and uncertainty, five Rosie the Riveters from the Bay Area will head to Washington, D.C. to meet the vice president after 100 donors decided to help the elderly women on fixed-incomes make the cross-country trip. Marsha Mather-Thrift, executive director of the Rosie the Riveter Trust in Richmond, Calif., said that the big contributors include Kaiser Permanente, Virgin America, the Plumbers, Steamfitters & Refrigeration Fitters UA Local Union 393, Trico Pipe, and the Electrical Industry Advancement Program for IBEW 302. In all, nearly $30,000 poured in, including free plane tickets. "The response was amazing," Mather-Thrift told NBC Bay Area on Friday. "From donors big and small. The outpouring was great. These women represent a huge number of Rosies around the country. These women deserve to go." The money will be plenty for sisters Phyllis Gould, 92, of Fairfax, Calif., and Marian Sousa, 87, of El Sobrante, Calif., and three other “Rosies” to visit the nation’s capital. Each of the women will be accompanied by a chaperone. The big trip comes after Gould received a personal invitation by phone from Vice President Joe Biden this fall. "We're all really happy that the public came to our aid, " Gould's younger sister, Sousa, told NBC Bay Area on Friday during a break being a docent at Rosie the Riveter/ WWII Home Front National Historical Park. "I am really looking forward to it. I had every confidence we were going to go." As for meeting Biden, Sousa said: "He's such a nice guy, not stuck up. He's one of us." Biden called Sousa's older sister on Oct. 22 to acknowledge Gould's place in history as one of the first women welders during WWII stationed at the Kaiser shipyard in 1942. 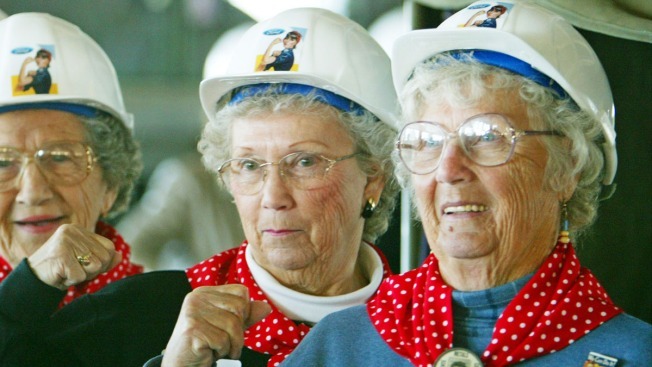 The Rosies have are a cultural icon, representing American women as a whole who worked in factories during World War II, often replacing men in jobs while they served in the military. Biden told Gould she came from a "remarkable, remarkable generation of women." And in classic Biden fashion, the vice president told Gould: "That's pretty impressive, kid." Then, Biden invited her to visit him, something she desperately wanted to do, but couldn't, as she and her pals live on fixed incomes. That prompted them to fundraise through the trust that supports the Rosie the Riveter/ WWII Home Front National Historical Park in Richmond, Calif., where most of them still work every week. Mather-Thrift said the women don't have an exact date to visit Biden's office just yet, but they've had representatives help them secure the future meeting. In the last few days, the women have had to give their Social Security information to clear their backgrounds before the visit. Aside from the sisters, the other three Rosie the Riveters invited on the trip were Marian Wynn, 87, and Kay Morrison, 90, both of Fairfield, Calif.; and Priscilla Elder, 93, of Pinole, Calif. They will take off from San Francisco International Airport on March 29, and tour Washington, D.C. and its museums and monuments until April 5. For her part, Gould thinks the whole thing is "fabulous." She's very anxious to know what's going to happen when she gets there. "I have no idea what the White House is going to do," she said. "They haven't told us anything."